Down To Earth Electrical (Malvern) could be the ultimate solution to all of your electrical needs. We are known for our ability to undertake virtually anything from installing a cooker or new light fitting to re-wiring your home. Whatever the task, we are committed to meeting your requirements with highly professional yet friendly approach. If you are buying or selling a domestic property and looking for confidence that the electrical installation is safe, or if you are a Landlord seeking formal documentary evidence for the electrical safety of your rented accommodation, then you need an Electrical Installation Condition Report. This is the industry-recognised document that details the condition of your electrical installation following a systematic visual inspection and thorough electrical testing. It confirms that the electrical installation is satisfactory or details what improvements are required to bring it up to standard. If you are a Landlord or you run a small business, you are legally required to ensure the safety of any electrical equipment provided for your tenants or employees (including yourself). 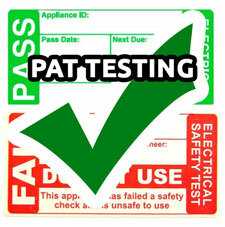 Although PAT testing is not itself a legal requirement, it is the best way of both meeting your legal obligations and providing documentary evidence that you have done so (in the unfortunate event that you should need to).